British Eventing team vet Liz Brown explains the best way to manage your horse after the cross country phase. Correct management of your horse after cross country will help to maximise recovery and we’ve got some tops tips to help. At a three-day event the horse should be cooled in the finish box with cold water, which should then be scraped off and interspersed with short periods of walking, especially if the horse is blowing hard. The washing, scraping and walking should be repeated until the horse’s respiratory rate, heart rate and temperature fall to acceptable levels (at a three day event a vet will check these for you in the finish box). 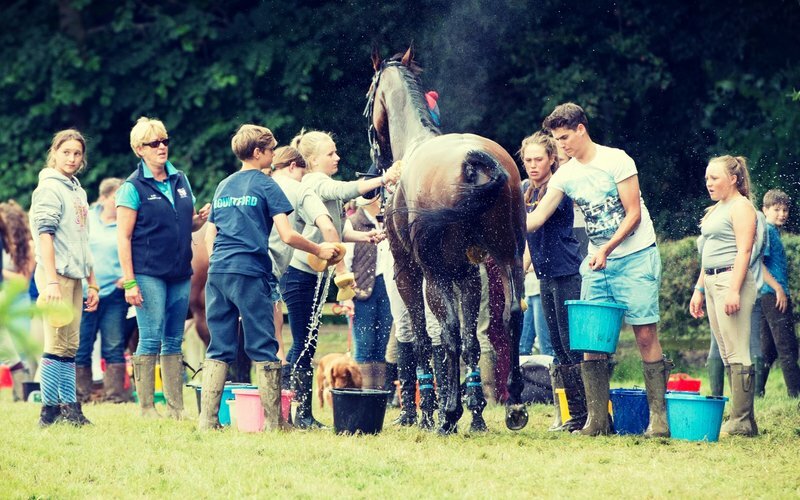 After cross country at a one-day event, unless it is a very hot day your horse will start to cool off as it walks back to the lorry and can then be washed off. If it is a hot day at a one day event, riders should jump off at the finish and loosen tack to walk back to the lorry; if someone is there to help it’s also a good idea to take off their saddle to walk back. Then once at the lorry follow the washing/scraping/walking routine described above. Remove studs before removing boots or bandages. This will help protect your horse’s legs in case you horse kicks out while being washed off, or treads on itself while being walked. Always choose the most appropriate studs for the ground conditions. Excessively large studs will result in abnormal torque, shear forces and jarring of joints of the lower limb, which will predispose the horse to injury. If the horse has lost a shoe, the foot should be protected with a boot or bandage, especially if you have to walk over hard or stony ground to get back to the stable or lorry. Cooling the legs helps to reduce heat generated during galloping and to counteract inflammation caused by jarring or trauma. Apply ice packs with a tubigrip or bandages, or cold boots to the areas covering the tendons and fetlock joints and to any specific areas of injury. Any ice or frozen substances should never be placed in direct contact with the skin. Ice should be applied for 20 minutes, and then removed for at least 20 to 30 minutes. Cold therapy causes vasoconstriction (constriction of blood vessels) followed by deep tissue vasodilatation (dilatation of blood vessels) and promotes an increase in circulatory flow. Cold therapy will reduce swelling and have an analgesic effect; therefore legs should be examined later for any signs of injury which may have been masked. Legs should be dried afterwards to prevent skin irritation. Clay can be applied once cold therapy is finished – inspect legs again first and do not apply over small abrasions or cuts. Carefully examine any wounds, however small. Assess the extent of the wound and the proximity to any joints or tendon sheath, or leakage of synovial fluid. Wounds should be cleaned thoroughly to remove dirt and foreign material and reduce risk of infection. Excessive haemorrhage can be controlled by applying pressure in the form of a bandage with padding or direct pressure on the wound until the vet arrives. Once cleaned, minor wounds can be dressed and bandaged. A vet should be consulted for anything other than minor wounds and certainly if the wound is accompanied by excessive bleeding, any lameness, if it is close to a joint or tendon sheath, or if you are uncertain. Struggling to cool down your horse in the heat? Click here to find out more about how to handle eventing in hot weather.